A field of 13 spellers from grades 6, 7 and 8 at Houlton Middle-High School spent nearly 90 minutes trying to crown the school’s next spelling champ. HOULTON, Maine — A field of 13 spellers from grades 6, 7 and 8 at Houlton Middle-High School spent nearly 90 minutes trying to crown the school’s next spelling champ. Nick Hardy, an eighth-grader at the school, correctly spelled “culprits” and “peasantry” to capture the school crown in an event that lasted 20 rounds and nearly 90 minutes. Seventh-grader Ariana Ardell finished as runner-up. The two students battled through six championship rounds before a winner emerged. Both Hardy and Ardell earned the right to advance to the Aroostook County Bee. 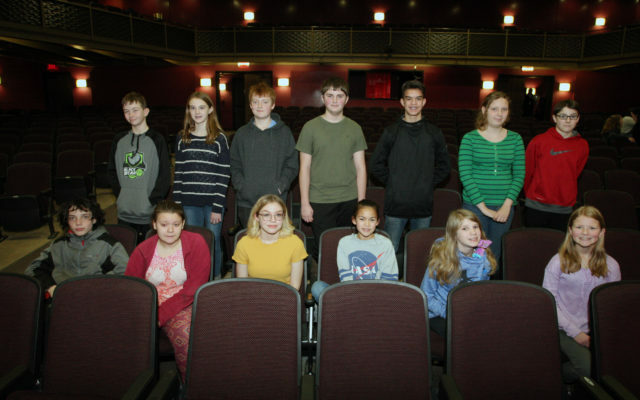 The Northern District (Aroostook County) Scripps National Spelling Bee competition for middle school students will begin at 6:30 p.m. on Thursday, Feb. 7, in Fox Auditorium at the University of Maine at Fort Kent. In case of inclement weather on Feb. 7, the competition will be held at the same time and place on Feb. 8. Erica Tweedie, a guidance counselor at the school, served as the pronouncer for the bee. Among the more challenging words students grappled with were “writhing,” defined as making twisting, squirming movements or contortions of the body, and “alabaster,” a fine-grained, translucent form of gypsum, typically white, often carved into ornaments. Others participating in the bee were sixth-graders Destiny Bulley, McKenna Phillips, Isaiah Ervin, Isaac Cosby and Madelyn Davis; seventh-graders Damien Bettencourt, Bronson Hanning, Tia Burlock and Kaitlyn Kenney; and eighth-graders Matt Conley, Launa Jay, Kristian Kellerhals and Xavier Sutter. Eighth-grader Nick Hardy, left, captured the Houlton Middle-High School spelling bee crown Tuesday morning. Seventh-grader Ariana Ardell finished as the runner-up. 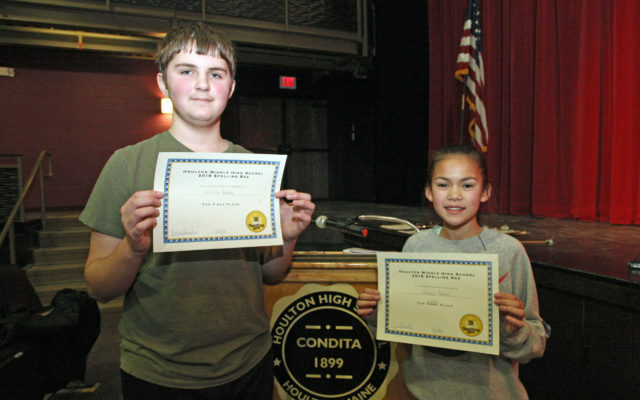 Both advance to the County Spelling Bee on Feb. 7 in Fort Kent.